Halvan is a guy with very lively imagination, playing with his favorite toy, a fire truck. In his imagination he dreams himself to the fire station, where he learns a lot about life as a fireman. You also get one day a play becomes serious. 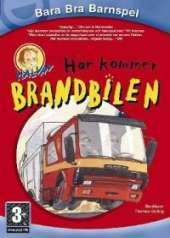 The story of Halvan and the fire station is an exciting interactive adventure. You are the one who is Halvan, and you are involved and participate in the story. Suddenly the alarm goes off. It is burning in the kindergarten Kompassen. All firefighters throw themselves in their clothes? Half as well. In 60 seconds they are ready in the car and drive with howling sirens to the day care center. At the fire station there is a lot to discover and learn. And you have to practice a lot to become a good firefighter. You can do this yourself with Halvan. Thomas Gylling from radio and TV is the narrator.